Sunscreen Lip Balm with SPF 15 - No Added Scent - Contains Organic Ingredients. Made in New Hampshire. Certified Organic base of Extra Virgin Olive Oil, Beeswax, Jojoba & Cocoa Butter is ultra-moisturizing and soothing for your lips. Safe, Effective, & Responsible. 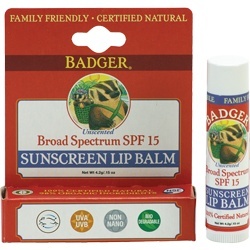 Badger's Sunscreen Lip Balm with SPF 15 protects with non-nano Zinc Oxide and is rich in certified organic ingredients. The ultra-moisturizing base ingredients provide added protection from wind, salt, and cold, keeping your lips happy and smiling. The 0.15 oz stick is easy to carry with you - at the beach, on the slopes - anywhere you need protection. Safe for children of all ages, blocks both UVA and UVB rays, and thoroughly moisturizes while protecting you from the sun. Your lips will thank you!